Genocide on Tamils in Tamil Eelam has a long history about 70 years. 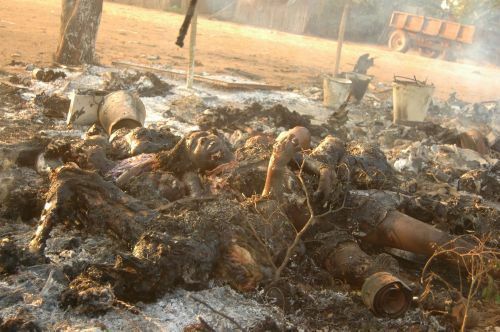 But the Mullivaikal Massacre is the symbolic genocide which is widely talk by Tamils and some other nations. At the final phase of the 4th Eelam war Hundred plus thousands of Tamil civilians were systematically killed by Srilankan government forces with the support of regional countries and the super power nations. The end of the war many war crimes led by the government forces as heavy artillery and MBRL barrages on civilian potions, shelling on civilian hospitals, using clusters and chemical ammunitions, executions of surrendered fighters and sexual assaults on women captives. The structural genocide is still happening on Tamil Eelam by SriLankan Government.